I’m a fan of a mixed greens salad. I like the idea of buying a bag o' salad mix because I buy more than one type of lettuce for my salad in a more affordable manner, but the quality of the greens are often more hit than miss. Bag o' salad mix tend to wilt and spoil quickly. 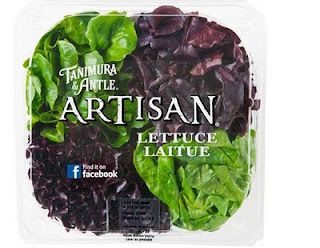 My friends at The Balancing Act asked me if I wanted to try working with Tanimura & Antle Artisan Lettuce. As a lover of real food and fresh vegetables, I was leaning toward a yes but with caution given my bag o’ lettuce woes. Then The Balancing Act told me that they are pairing with Tanimura &Antle to bring more fresh fruits and vegetables to the school lunch rooms by working with the United Fresh Foundation's Let’s Move Salad Bars to Schools campaign, and CPMA’s Freggie’s Children’s programs and the School Nutrition Association (SNA) I fully support initiatives that move kids away from the type of food I grew up with – dinner from a box and vegetables from a can – bleach! I wasn't sure what to expect from Tanimura & Antle, but if it gets one kid to realize fresh vegetables won't kill them, then I'll do it for the kiddos. I was surprised to see Tanimura & Antle Artisan Lettuce comes as four crisp heads to a plastic clam shell package (red and green varieties of Oak, Tango and Gem lettuce) than in a plastic bag. The varieties added a variety of spice and texture to my salads. Unexpectedly it took a bit longer to use them than I would have liked due to a few life got in the way situations. I was happy to find the Tanimura & Antle Artisan Lettuce (as well as the other fresh celery, cauliflower, Artisan roman, and leafy romaine lettuce Tanimura & Antle generously sent us to try) lasts longer in my refrigerator than my regular brands of fresh produce. Nicely done Tanimura & Antle! The price is right too. I priced Tanimura & Antle Artisan Lettuce at three different grocery stores (Aldi, Sam’s, and Costco.) It cost under $4.00 a package – cheaper than bag o’ salad and in my opinion a better return on investment. I did not toss anything due to wilting or spoilage as I sometimes do with other brands of bag o' salad mix. 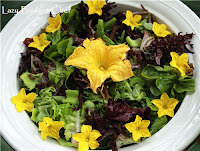 I used the Tanimura & Antle Artisan Lettuce and celery to make a crisp salad for dinner. Since this is fancy hand tended lettuce (that's why they call it artisan), I want to treat it right. I pulled an easy (and cheap!) wow factor by adding squash and cucumber flowers from my heirloom organic garden to the salad. You can eat these flowers! In typical Lazy Budget Chef fashion, I did not have salad dressing on hand. Buying a tasty salad dressing that isn’t loaded with high fructose corn syrup, extra fats, and things I would rather my family not eat isn’t easy to find. I’ve almost given up on store salad dressing after spending too time than I like reading all of the salad dressing ingredient labels in the grocery store aisle and coming up empty. So I made the salad dressing myself. 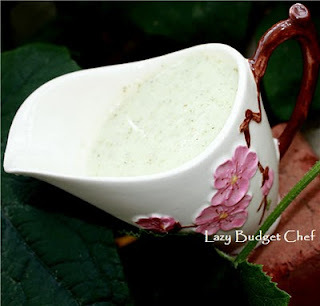 I made a quick salad dressing from the growpocalyspe of heirloom cucumbers in my garden. Yes friends, Tzatziki (tat-zee-key) sauce isn’t just for gyros! You can use tatziki (also spelled tzadziki and tzatskiki) sauce as salad dressing too. Or at least I do. 1. Combine the yogurt, chopped cucumber, olive oil, dill, garlic, and lemon juice in a blender. 2. Use the blender to mix the ingredients together. 4. Add the salt and pepper to taste. 5. Pour it on and enjoy! What kind of dressing do you like on your salad? Did you like this post? Get more like it by subscribing to the Lazy Budget Chef RSS feed or by subscribing to Lazy Budget Chef by email. Disclaimer: I am a Balancing Act Community Blogger and received samples of Tanimura & Antle produce to facilitate this review. All opinions are my own. it's so beautiful, but not intimidating! This dressing looks delicious!!! I have GOT to try it!!! Share what you have to say! The good and the not so good. Disagreeing is fine but no hair pulling please. Thanks! My New (to Me) Canning Equipment!